BY INVITE ONLY – Transitional class similar to Mom & Me but the parents are not participating in the class with the child. The parents will remain in the foyer area. This class is available for the children who have participated in the Mom & Me program and are ready to do the class by themselves. 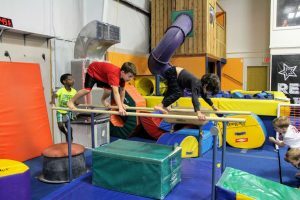 BY INVITE ONLY – Designed for the gymnast who has mastered the basic gymnastics skills and are ready to be introduced to the next level of gymnastics. Instructor approval is necessary for placement in this class. Must Have: A willingness to learn. Introduction to forward/backward rolls, handstands, cartwheels, round-offs and bridge kick overs. Your child will perfect standing & running back hands on the floor. Introductions will also be made to front handspring in the pit and on the floor. Must Have: Must have round off back handspring on the floor – NO SPOT. Introduction to the basics of back handspring series, back tucks/front tucks. Progress into round-off tuck, round-off back handspring tuck & front handspring tuck. 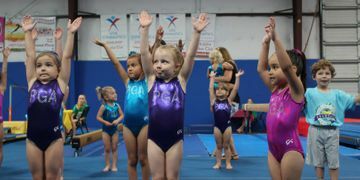 The class will start training punch tucks and standing back tucks. This is an introductory to cheer & tumble for girls. 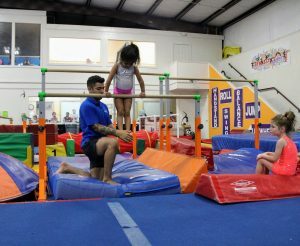 Your child will be taught basic cheer and tumble progressions, proper warm-up techniques, flexibility, stretches and conditioning exercises. 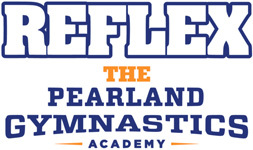 They will be introduced to the “safety” fundamentals of tumbling along with a lot of recreational fun! Tight motions, jump technique and cheer dance choreography will also be a major part of these classes. Perfect for anyone wanting to try out for their Jr High or High School Cheer Team!